Our first morning in Amalfi dawned fresh, clear, and inviting. We sipped coffee on our balcony and feasted our eyes on the town below as it slowly roused itself from sleep. Later Jess and I went for a walk through town while Lena napped and Elliott worked back in our little apartment. This Arab-Sicilian cathedral dominates the skyline and its bells ring the hour throughout the town. We explored around the church and then sat on the steps for a long time, talking and watching the town below us. 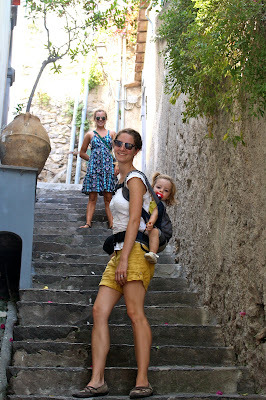 We definitely felt like we were in the heart of the Amalfi Coast for, although they are literally a dozen towns strung like pearls on a necklace along this coastline, only three are considered the crown jewels. These three are Amalfi, Positano, and Ravello, one of which we were staying in, and the other two of which we wanted to visit later that day and the next. That afternoon we went to the beach below our apartment. August is the holiday month in Italy and so the free beach (the one where you didn't have to pay for a lounge chair and umbrella) was crowded with adults and children of all ages. 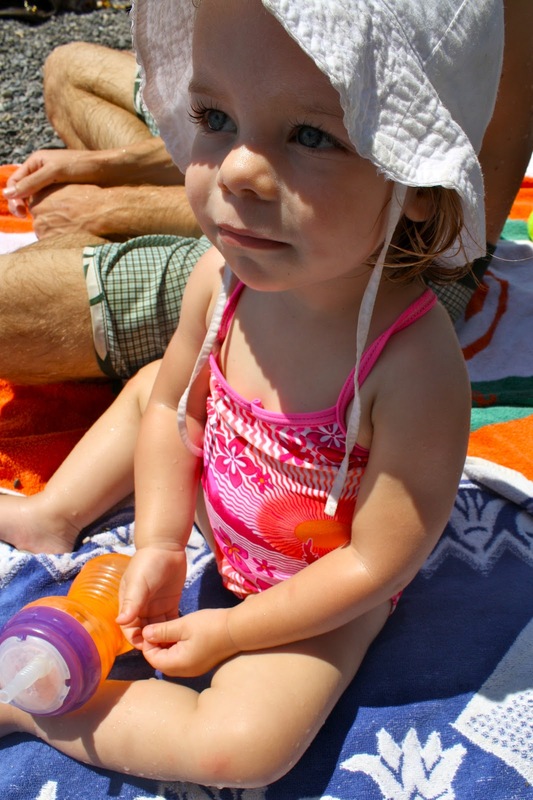 We found a little patch of ground on which to put our towels and soaked up the sun. This guy cracked me up, cast out full length in the sun at the water's edge with just a couple of sandals for a headrest! 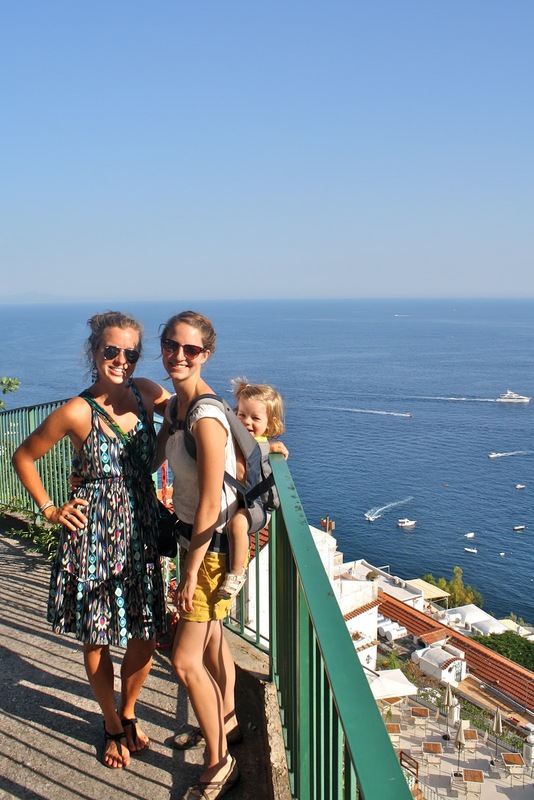 We loved being surrounded by Italians and only a few Europeans; I never heard another American accent on the Amalfi beaches. All the Americans, actually, seemed to be in guided tours and generally passed through in large groups in the morning, leaving no other English-speakers in their wake. So many stairs from the top of town to the beaches! 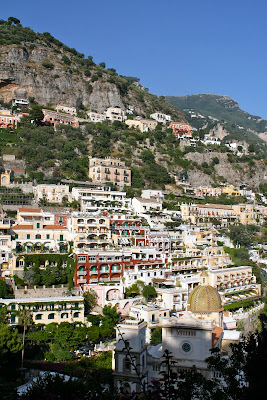 Positano truly is an up-and-down town. We didn't know anything about the structure of the town, so we took the first parking spot we found, right at the top of the hill. We walked all the way down, drinking in the view as we went, and explored for awhile before hiking the steep, steep hill back to our car. About that time we realized we were on a one-way street now... and then had to drive all the way down the hill to the beaches before we could get on a two-way street going back to Amalfi. Whoops! My calves were aching for the rest of the week. A word to the wise: do what the tour books say and park in the municipal parking lot at the bottom of the hill! Lena saw I was resting an interesting chair and asked if she could sit there instead of me. Honey, just let your mama sit down! As the sun was setting, we bought pasta, vegetables, and sauce at a little alimentari and then drove home to a simple supper in our apartment. The plan for tomorrow? 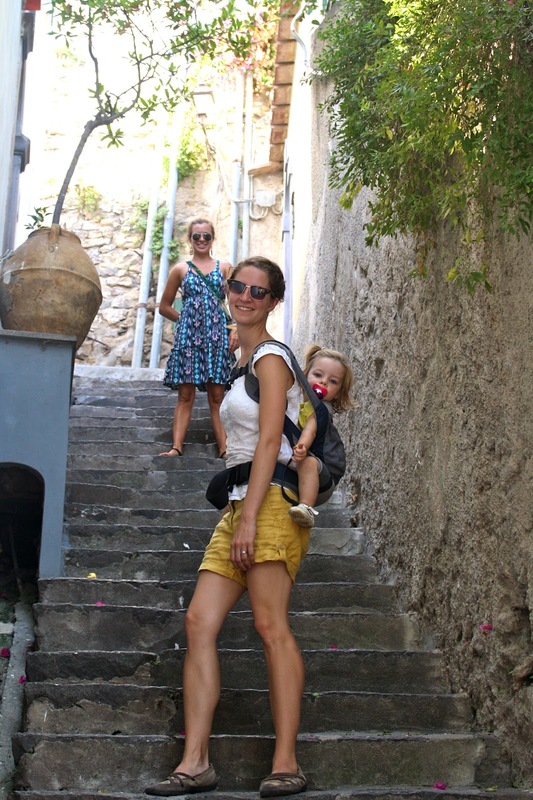 Spend more time at the beach, visit Ravello, and then Elliott and I wanted to go out for a seafood dinner. I'll share those photos on Monday! I LOVE the color everywhere in the buildings. It's energizing and yet so livable. 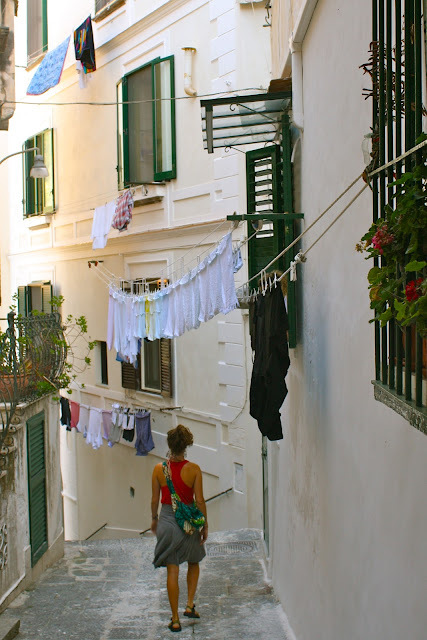 Every time I read your posts, and see the pictures you take, I grow more in love with Italy! 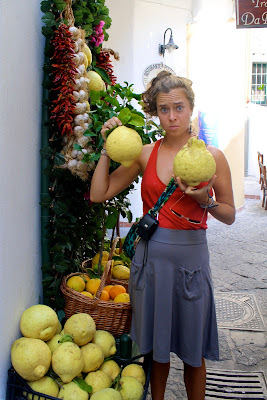 Are those Lemons that Jess is holding? I've never seen any that big in my life. Lena's hair is getting so long! Yep, that's a lemon. We couldn't believe the size either! Unlike in Sicily, lemons grow year-round on the Amalfi Coast.